Rembrandt portrays himself here with his first wife, Saskia van Uylenburgh (1612–1642). Both are attired in 16th-century costume—Saskia with a veil, and Rembrandt with a feathered beret. The image likely began as a study of Saskia, though at some point the artist inserted his own figure decisively looking out (at a mirror) to study himself and his wife. In doing so, he altered the nature of the image and presented various options for its interpretation. 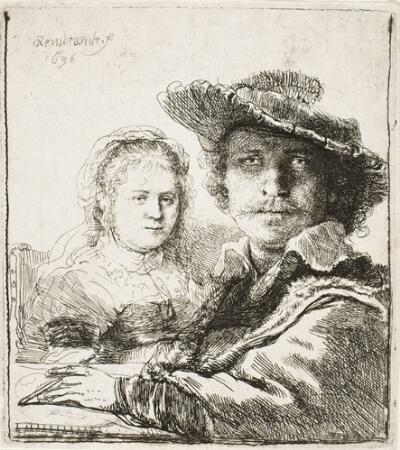 On the one hand, as the only formal double portrait of the couple, the etching belongs to the subgenre of marriage portraiture, as Saskia bears witness to her husband’s occupation. On the other hand, the image may allude to the theme of love as the source of artistic creativity. A popular Dutch motto, “Liefde baart kunst” (“Love brings forth art”), captures this idea. That Rembrandt depicts himself as momentarily interrupted in the occupation of drawing is confirmed by his porte-crayon, a two-ended holder for his medium. Drawing, or disegno, reigned supreme in the artistic theory of the period. Since drawing was viewed as the most vivid, pristine record of what emanates from the artist’s imagination, it is hardly coincidence that Rembrandt depicted himself thus engaged.